Bringing a cat in your home is a great pleasure because they are very fluffy and cuddly creature that your children will like a lot. With all the happiness that cat brings it also brings some responsibility as well. You need to be very careful while adopting a cat because cat is a very wild animal and at the same time it is also very delicate animal. You need to provide you cat a very secure and sensitive environment for proper and healthy growth. They have a very sensitive digestive system which needs specific diet and they also have some very crucial behavioral problems. These problems can be solved only with some proper and professional training to curb your cat. I have seen people who bring cat home but they do not take much care of their cat and that makes that cat very wild and unpleasant for home environment. Without proper attention and guidance, cat can ruin the whole interior of your house as well as it will give you some very annoying situations to deal with. 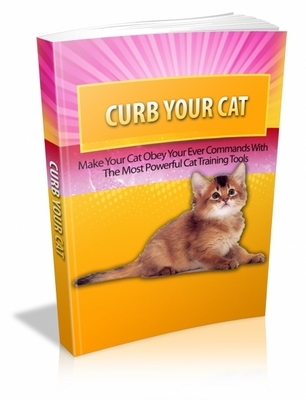 In this EBook I will try to cover all the important aspects that are necessary for curbing your cat. I have gathered this information from different very patent sources and have tried my best to add certified and patent information. You will find this EBook very amusing as well as very helpful as you will learn lots of interesting facts about cats in this EBook. There are different things like behavior problems, types of cats, problems with cats, health problems of cat and other similar things and in this EBook I will try to cover all of these aspects carefully and will try to give you solution of almost every cat related problem. After learning about the behavior of cats in the above chapter, now I will tell you those different methods that can help you to identify and cure cats behavioral problems. Curb Your Cat. Training Made Easy Audio Book And Ebook.